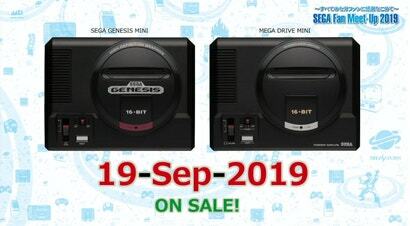 Sega will release the Sega Genesis Mini worldwide on September 19, it said today. It will include 40 different games, and at least some versions will have Gunstar Heroes and Castlevania Bloodlines. Sega made the announcement on stage at Sega Fes 2019, its annual fan event in Tokyo. It only announced games for the Japanese Mega Drive Mini, including Sonic 2, Puyo Puyo 2, Shining Force, Castlevania Bloodlines, Powerball, Gunstar Heroes, Comix Zone, Rent-a-Hero, Space Harrier 2 and Madou Monogatari Ichi. Since a few of these games are Japan-only, it stands to reason that the US and European lineups will be different. While Sega was light on details about the Mini in its stage presentation, it did say the six-button controller would be the same size as the original’s, and that the games would have a save-anywhere function. In Japan at least, it will be sold in two variations: With one controller for ¥6980 (about $89), and with two controllers for ¥8980 (about $114). Sega did not immediately announce the pricing or any specific games for the version Australians will receive. Sega first announced the Mega Drive Mini at last year’s Sega Fes, and it was originally supposed to be released in 2018 only in Japan and based on the same AtGames-developed technology that powered the US exclusive Genesis Flashback HD. Later, Sega delayed the unit into 2019, saying that to achieve a higher level of quality it would drop AtGames, develop the software for the system in Japan, and release the unit worldwide. Given the generally negative critical reception to the Flashback HD, especially compared to Nintendo’s mini classic systems, Sega seems as though it’s aiming to salvage its brand’s reputation in the classic-console market. Does anyone know what happened with Sega and Sonic 3? It seems to be some dark secret why they won't release it on phones like sonic 1 and 2 and also won't touch it for the MegaDrive mini? Apparently there is some music licence issue, ya know, the whole Michael Jackson having had some input thing. If I put my tinfoil hat on, I'd say it's because apparently Michael Jackson wrote the music to Sonic 3, so more than likely licensing issues for releasing it on more platforms than was previously arranged. Dang, September? Why you make me wait that long Sega? Also M2 are doing the emulation. Sega's emulation is pretty good, so a plug in console with 40 games should be pretty tops. That being said, save yourself the hassle and just buy Sega Classics Collections on literally every current console? Well the appeal of these classic systems is that they are plug and play, you don't need another console to run them. Eventually many people are going to stop playing this current gen of consoles, perhaps even sell them or trade them in to get the next generation, and then they can't play those games anymore. With these classic systems though you'll always have them on hand. Eh, PC is eternal, and Xbox and PS look to be backward compat going into the future anyway. Well, I guess there's also the appeal that they look just like a genuine system, only smaller, and they have actual genuine controllers, meaning you can play these games as they were intended to be played. In the case of this Mega Drive classic, most modern controllers don't come with the 6 button face layout that the Mega Drive used (I know there was a 3 button controller but they'll be shipping the later 6 button model with this) and there's something not quite right about playing one of those games that used the 6 buttons in that configuration on a PS4 or Xbone controller that only have 4 face buttons. While you can always make the argument that emulators are a thing - and you wouldn't be wrong - again it comes back to the convenience factor. Being a small plug and play system, you can just throw it in a backpack and have it up and running on any TV in seconds. Modern consoles aren't quite that portable - with the exception of the Switch of course, they are big, heavy and bulky and need big power adaptors. It's another reason one of these would trump emulation on a PC, though yes Raspberry Pi builds are a thing too. Another advantage over emulation, if you care about this kind of thing, is owning actual genuine licensed copies of these games and not illegal roms. To confirm - that's in Japan only, not in Australia. Actually what I heard is that the US version - that is, the Genesis Mini, will ship with the 3 button controller. 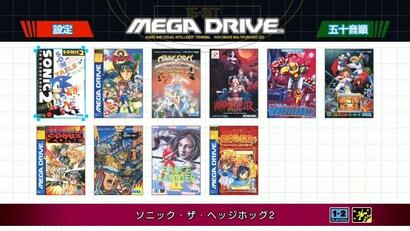 The Mega Drive mini that Japan and Europe/Australia will get however will have the 6 button controller. I didn't think nintendo set the bar that high with the snes, but sony showed how half-assed it can be done. I'm super skeptical of sega having any clue these days, but hopefully the delay means they'll pull their finger out and do it right. Hopefully it will be cracked/exploited as easily as the other mini consoles. 10 games? They said the system will have 40 games.